How to Choose a Soil Sampling Drill | Little Beaver, Inc.
Portable soil sampling equipment is gaining traction. 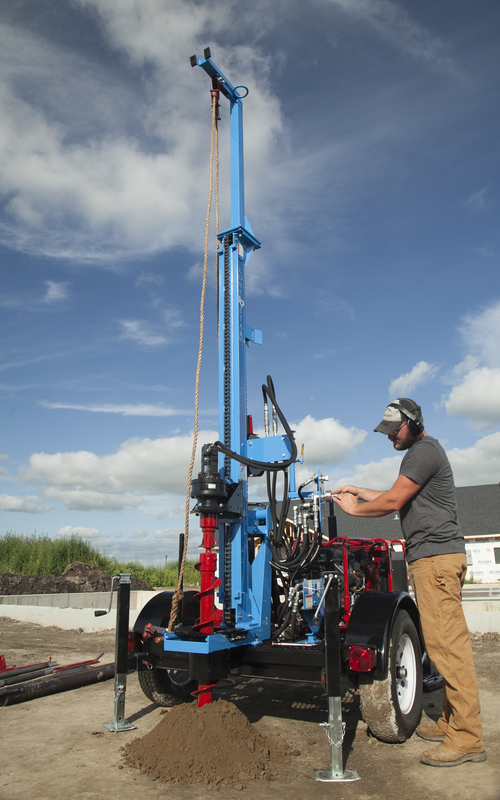 Soil sampling contractors will often supplement their fleet of large truck-mounted or tracked drills with compact units that are far gentler to turf and can work in confined spaces. For others who want the convenience of owning soil sampling equipment, such as site prep or design-build contractors, portable soil sampling tools are an economical foot in the door. • They are highly portable. • They can drill as deep as 100 feet. • They work well in various types of soil, including sand, clay and soft rock formations. • They have comprehensive soil sampling capabilities, allowing users to conduct Standard Penetration tests, geotechnical testing, split spoon sampling and hollow stem sampling. To decide which drill model is right for you, consider how you plan to use it and the demands of your worksites. You’ve Got: A small tow vehicle and a smaller budget. If you are on a tight budget, look for a unit that is lightweight and can be towed using an ATV or small pickup. 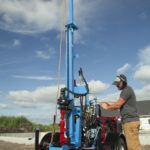 Many of these trailer-mounted models are cost effective yet offer the oomph needed to drill as deep as 100 feet, even through rock formations. You’ve Got: Hard soils and hard deadlines. For maintaining highs speeds even when powering through harder soil, choose a drill with ample torque and pull/push back force as well as a healthy rpm. Rotary speeds around 100 rpm will be enough to make short work of larger jobs, ensuring you can finish projects on time and on budget. Lastly, a drill with a heavy-built frame will stand up to the demanding work ahead of it. You’ve Got: A need for SPT and plenty of towing capacity. With more and more states and cities requiring automatic hammers for Standard Penetration Testing, you will need a drill that gives you consistent SPT results. Regulations aside, if you plan to conduct a lot of SPT, you will want a drill with an automatic hammer to reduce worker fatigue, creating a safer and more productive jobsite. Because an automatic hammer configuration will add weight to the rig, be sure you have a vehicle with ample towing capacity to handle it. You’ve Got: Tight spaces and big plans. If you know you’ll be working in limited access locations, such as backyards or even residential basements, you will need an extremely mobile drill. Transport dimensions of 26 inches wide and 80 inches tall are compact enough for the drill to squeeze into an elevator to reach a basement and easily fit through gates and doorways. And if you want the option to expand into other applications, such as foundation repair, you will want a rig able to dig close to structures and light enough to prevent lawn damage. For more information about choosing the right soil sampling equipment, talk to a Lone Star expert at 1-800-227-7515 or reach out through email.